Move over dancing hot dog, because there's a hot new Snapchat filter in town and he's ready to electrify the competition. Crack open the messaging app right now and you'll find Pikachu the Pokemon alongside the dog faces and flower crowns. 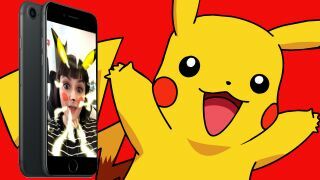 The new filter doesn't just give you rosy cheeks and adorable yellow ears - open your mouth, and a tiny Pikachu will fling himself at your cheek for a kiss while lightning crackles around you. The new lens is thanks to a big old love-in between The Pokemon Company and Snapchat, but will only be around for a limited time. We pestered The Pokemon Company to find out how long the lens will be around and if we can expect more Pokémon selfie options in the future, but it's staying quiet on the subject for now. Fans are freaking out over the new lens, and not just because it's super flattering on weary Monday faces. Prepare for your Twitter, Facebook, and Instagram to be full of selfies as long as this lasts, because Steve from accounting really, really wants to show you his Pikachu face.